We’ve all heard of Peak Oil. But M. King Hubbert’s original paper also covered Peak Coal and Peak Uranium. It turns out there are peaks in pretty much everything that we dig out from under rocks. And speaking of that, it turns out that Hubbert’s insight also applies to this year’s crop of Republican presidential candidates. What’s more, we can put this all in handy chart format — and thanks to modern technology we can do it much more colorfully than Hubbert could. 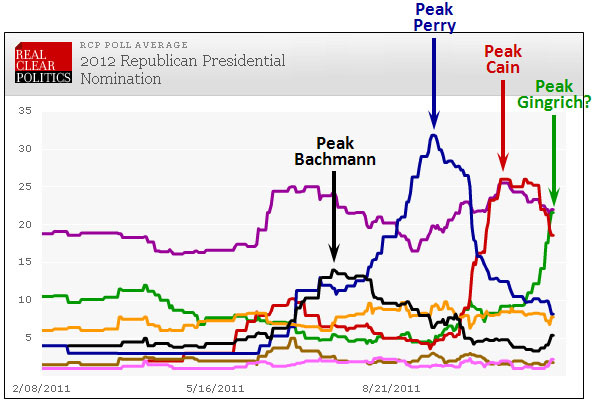 Using RCP’s poll average as a foundation, all the various GOP peaks are documented below. Based on this, I project that Newt Gingrich has about two weeks left before his excessive verbal extraction rate depletes his reserves of grandiose nonsense and his moment in the sun is over.